During the mid-twentieth century, Design Leadership ruled! This new area of the auto industry helped cement an American auto maker, GM, at the top of the business world. Many would agree today that introducing the Motorama concept became central to the General Motors universe and is now an idealized portrait of one of the greatest moments in American auto history. Creating all of GM's product designs before, during and after WW II (from the late 1920s through the 1950s), did not come easy and the leadership mantle of the world's largest industrial corporation never rested on their laurels. During this era, GM's major innovations/inventions, like the traveling Motorama Shows, would create more mystique behind the company's mainline products. 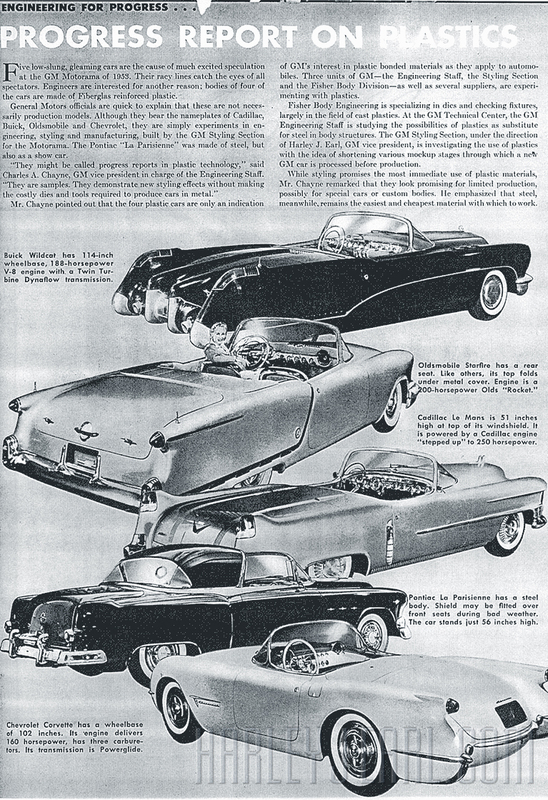 Sue Vanderbilt, one of GM Styling's newest female designers (hired in during the mid-50s), said this controversial statement in a 1960 magazine article, "Harley J. Earl dragged Engineering kicking and screaming into the 20th Century." The quote allows audiences today to envision how many traditional Detroit engineers, during the mid-20th Century, didn't like many of maverick artist-engineer-Earl's moves. Making GM's cars "to sell" was a big job and HJE could care the least about winning some sort of "popularity contest" inside the American auto industry. Motorama enclosure section (15-pages) within the Los Angeles Examiner. As this article from GM Folks magazine (Jan., '53) affirms, the innovation of using "Plastics" was experimented on for the first time in HJE's hybrid-engineering facility. Like so many other aspects of this story, once you get on the right scent trail, then it's not hard to understand. HJE's lifestyle creations thrilled audiences everywhere.